NEW prose stories, including The Green Hornet and Kato's final showdown with the notorious Yellowjacket and "Clicker" Binney's origin story! Want to read about how Mike Axford pulls a sting on The Hornet? Or, about how The Hornet and Kato take on homegrown terrorists? It's all here, along with the return of Doctor Fang, and a story about Britt and Casey reaching an important turning point! 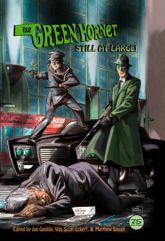 This hardcover volume includes a timeline showing how all 3 volumes of Moonstone stories fit into the chronology of the TV episodes, and a BONUS story in which the radio era Green Hornet meets Richard Benson, The Avenger! 302 Pages. 6" x 9"